Most Americans understand the meaning of heritage. Those of us who own land having historic significance are proud of it. We believe we have the right to live on it and use it, but we want to use it wisely. We try to protect the historic values and we enjoy sharing our knowledge of history with others who have a common interest. If the lessons learned from history are a guide, the answer should be obvious. From Biblical times to the present, land has been the source of wealth and power. When only a few people own or control the use of land—the natural resources such as minerals, water, timber, oil and grazing land—they control the wealth of a nation and, as a result, they control the people. The Prophet Michah warned, “Woe to them that devise iniquity, and work evil upon their beds! When the morning is light, they practice it, because it is in the power of their hand. And they covet fields, and seize them; and houses, and take them away: so they oppress a man and his house, even a man and his heritage.” Isaiah likewise warned, “Woe unto them that join house to house, that lay field to field, till there be no room, and ye be made to dwell alone in the midst of the land!” Is human nature any different now than in Michah’s day? The Founders fought a War for Independence from a king who owned and controlled the land. Men like James Madison, Thomas Jefferson and Patrick Henry wanted the individual citizens to own the land and to be free from control by the king, the government and special-interest corporations. Madison warned, “There is an evil which ought to be guarded against in the indefinite accumulation of property from the capacity of holding it in perpetuity…The power of all corporations ought to be limited in this respect. The growing wealth acquired by them never fails to be a source of abuses.” The Founders knew freedom depends on private ownership of land. Modern ‘preservationists’ ignore real history and the words of the men who wrote it. What is happening in McDowell is little different than what is happening at other “historic battlefields” and in hundreds of rural communities across America. It has almost nothing to do with preserving history. “Historic preservation” is a straw man. It is a blind, a mask concealing from the average American of good will what ‘preservationists’ are really doing. Control of people and their property is cloaked in words of deception—nice-sounding phrases which can be twisted and used to manipulate people. The words, “Historic preservation,” are used in much the same way as ‘scenic byways,’ or ‘preserving endangered species,’ or ‘protecting watersheds.’ The words are about power and money, and the greed of a few powerful people. The words are about controlling people and their land—the wealth of our natural resources by government bureaucrats and agencies, and by the special-interest “partner” organizations, funded by government and who do their bidding. The Shenandoah Valley Battlefields Foundation (SVBF) is just such an organization. Stripped of all the fine-sounding words and all public-relations gimmickry, it is little more than a well-dressed, sugar-tongued, real estate agent for the National Park Service (NPS). The SVBF is the official “Management Entity” for the Shenandoah Valley National Battlefields Historic District. It is the “private corporation” arm of the US Department of Interior National Park Service. A major portion of the funds it uses for land acquisition, in McDowell and for other battlefields in the Valley, comes from the NPS. It is given “technical assistance” and is guided by NPS staff. It is the ‘brain-child’ born of the marriage of the NPS and the preservationist elite. 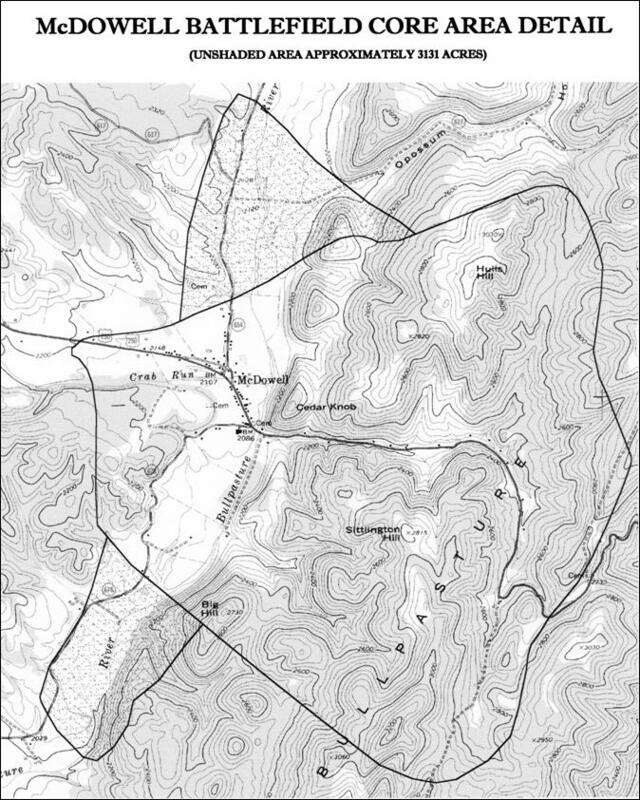 Above: overlay of the official NPS McDowell battlefield boundary on a USGS Topographic map. The core area/study area in McDowell covers 3,131 acres. For Highland County, the total is 4,539 acres. About 15 years ago, the McDowell battlefield was “surveyed,” “studied” and “inventoried” by the National Park Service. Few, if any landowners were told what was happening. The “core area/study area” was mapped and the boundary lines were drawn by the NPS, just as was done at each of the other battlefields in the Valley. The documentation is there for anyone to see. These are not opinions, but facts from NPS and SVBF documents. For the National Park Service and its “private, non-profit corporate partners” such as the Battlefields Foundation, all the “inventoried” private land in the battlefield “core area/study area” is prime “assets” to be acquired with funding from the NPS and other federal and state agencies. If history is a guide, once the Battlefields Foundation and its “partners,” such as the Civil War Preservation Trust (CWPT) which now owns 126 acres of the battlefield, acquire enough land in and around McDowell, in the “core area” of the battlefield; once they have the necessary “critical mass” of land, they will turn it over to the NPS to be included or managed in a Battlefields National Park system. This could take a number of years. As SVBF Executive Director Howard Kittell stated about their land acquisition goals, “It’s all a very slow process.” Howard Kittell and those who work with him are patient people. Their long-range Management Plan is published and can be easily understood by anyone with a little common sense who is willing to research the facts. As long as funding is allowed to continue, they will continue to purchase more private land. In Virginia, every inch of ground is “historic.” Just as the boundary lines of National Parks and “historic battlefields” have been “expanded,” the NPS, the Battlefields Foundation and their “partners” will look for and find reasons to expand the boundaries of the McDowell battlefield. Most Highland County residents don’t know what a National Heritage area is, and were never told the National Park Service had included the county in a National Heritage Area (NHA) in the mid 1990s. Today, most are still unaware of it. The real meaning of inclusion in a NHA was not explained to Highland landowners. The ‘historic preservationists’ knew exactly what they were doing, but it is doubtful even the county supervisors fully understood what was happening. The federal ‘carrots’—tourism, honorary recognition, funding, economic assistance and grants—were dangled before the county, but use of the ‘stick’ was down-played or never mentioned. County supervisors trotted right along, trying to get at the ‘carrot’—not understanding who was sitting in the saddle pulling at the reins. The federal “partners”—the Historical Society, the Chamber of Commerce and the Valley Conservation Council—prodded the horse along. County supervisors have consistently approved the federal funding for NHA ‘historic preservation’ projects in McDowell. The result of federal land acquisition funding has become clear, but many local residents still do not understand the county supervisors have supported it from the start. A NHA is a form of Regional Government where local decision making power is weakened or handed over to unelected agencies and officials. In a NHA, the US Department of Interior National Park Service exercises tremendous power and control by funding its “local partners” such as the Highland Chamber of Commerce and the Highland Historical Society who work behind-the-scenes to influence county planning and zoning decisions. The leaders of both organizations promote the ‘preservationist’ agenda and they actively seek more and more funding from federal agencies. Diane Klein, Carolyn Pohowsky and Don Hower are members of the Comprehensive Plan Review Committee, now meeting to amend the Highland Comprehensive Plan. They all favor more federal funds for ‘historic preservation.’ Pohowsky worked to turn US Rt. 250 into a Scenic Byway. 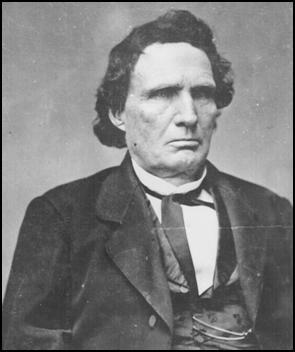 Hower worked to kill a major road improvement project. As one strategy, preservationists lobby for state or federal acquisition of your property, regardless of whether you want to give up your land or your way of life. They follow an almost standard formula: they decide behind closed doors what they want, then mount a publicity campaign claiming that your land is “threatened” (at root because it is privately owned), that it is “nationally significant” (because they describe it in emotional, poetic terms), and that it ought to be “protected” as a park for the “common good” (which is what they call displacing one group of people—the owners—for the benefit of another more affluent and politically powerful group—themselves). That’s the direct approach. A more indirect approach uses land “registry” programs, which purport to merely “list” sites in private ownership. Registry programs do not always authorize land acquisition or regulatory prohibitions through the program itself, but are referenced by other State or Federal laws—either already on the books or planned for the future after private owners are locked into the program. This provides some measure of control and, preservationists hope, buys time for future action. —“National Natural Landmarks: Takings by Quicksand,” Erich Veyhl, The Land Rights Letter, February 1991. In 2000, the Green Box/ Dumpster battlefield beautification project was paid for with federal ISTEA funds billed through the Chamber of Commerce. Don Hower stated, “We don’t get paid. None of the [battlefield] commissioners are paid.” The Hower family, Gobbler’s Nob Nursery and Tree Farm, was paid $5,624.00 for the project work. $60,000 in ISTEA funds paid for the “battlefield parking lot” on US Rt. 250. Many county residents believe this was nothing more than a scheme to ‘monkey-wrench’ road improvements for US Route 250. Don Hower was a key promoter of the parking lot. $77,240 in ISTEA funds paid to the Highland Historical Society through the Valley Conservation Council for a “conservation easement” on the “river field.” The Society claims they “purchased” the 52 acre field for $99,500 when, in fact, most of it was paid for by the ISTEA funds and they immediately sold half of it to Rev. and Mrs. LaPrade for $45,000. The facts about the LaPrade sale were kept a virtual secret. $11,384.13 in ISTEA funds paid for the Valley Conservation Council to promote conservation easements, to protect the “historic Rt. 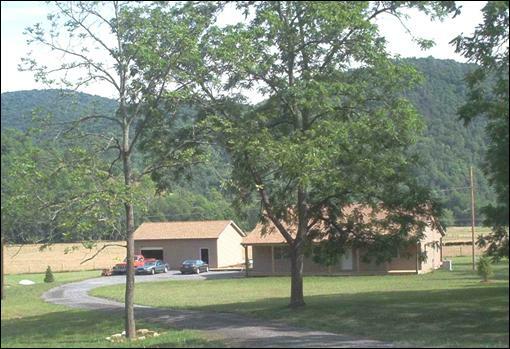 250 corridor” with a Scenic Byway and to “plan the future” for Highland County residents. All of the funding, for these projects and others, was supported by and had to be officially approved by the Highland County Board of Supervisors. These projects and land acquisitions in McDowell would never have been possible without the supervisors’ approval. 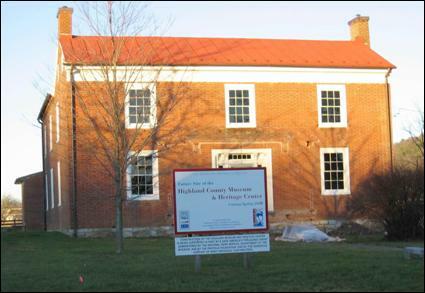 Unless Highland County completely divorces itself from the National Historic District, the next step to establishing a National Park unit will be to nominate the McDowell “core area” as part of a National Historic Landmark. The NPS and the Battlefield Foundation are fully aware of this. In 1960, the National Park Service created the National Historic Landmark Program to allegedly “encourage the long range preservation of nationally significant properties that illustrate or commemorate the history” of the United States. The National Park Service is in charge of identifying and approving National Landmarks. All National Historic Landmarks are included in the National Register of Historic Places which is the official list of the Nation’s “historic properties worthy of preservation.” Some properties are recommended as “nationally significant” when they are nominated to the National Register, but before they can be designated as National Historic Landmarks, they must be evaluated by the National Park Service’s National Historic Landmark Survey, reviewed by the National Park System Advisory Board, and recommended to the Secretary of the Interior. Some properties listed in the National Register are subsequently identified by the Survey as nationally significant; others are identified for the first time during Landmark “theme studies” or other special studies such as the studies already done in McDowell during the late 1980s and 1990s. 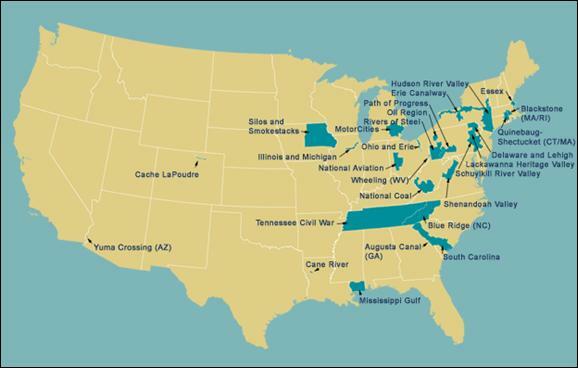 Both the National Historic Landmarks and the National Register programs are administered by the National Park Service. In 1988 the National Parks and Conservation Association (NPCA), a legislative lobby organization working closely with the NPS, produced a 10 volume study for Congress and the NPS recommending how the NPS should be operated and expanded by millions of additional acres. A major theme in the NPCA recommendations is the accelerated use of Landmarks for the creation of new National Parks. Calling Landmarks “Ladies in Waiting,” the NPCA urged, “The candidate sites and landscapes have already been identified—they are long overdue for protection.” In other words, the NPS knows where they are, and when the time is right, they will be nominated for Landmark status. Shrouding the goals governing what the NPS, the Battlefield Foundation, the CWPT and almost every other organization and individual working with them are doing in McDowell, is a veil of deception, secrecy, half-truths and in many cases outright falsehoods. In a great number of instances, the Park Service was found to be trespassing and snooping around private property—evaluating it for Landmark designation without ever notifying the landowner. The most prevalent abuse occurred in Maine, where the Park Service routinely ignored its own notification rules and refused to inform landowners of pending designations. NPS claims that property owners love the Landmarks program and are eager to join. If this is true, why the deliberate secrecy? And why do so many property owners fear a Landmark designation? In fact, the Park Service was working in collaboration with environmental organizations and land trusts, targeting private property for future Landmarks. Syndicated columnist and author Alston Chase documented several examples of Park Service misdeeds under the program. Jim Shelly, a New Mexico rancher, didn’t learn that his property was being considered for a Landmark designation until a friend noticed the nomination notification in the Federal Register. The Nature Conservancy had evaluated Mr. Shelly’s land for the Park Service without his knowledge. The Battlefield Foundation says it does not want to own homes and buildings in McDowell, but the Park Service has never had a problem deciding what to do with homes and buildings. The Park Service has not given up on “eliminating” the homes and people of Canaan Valley. The Battlefield Foundation is not directly accountable to the people of Highland. Its board of directors is not elected by the people of Highland and there is virtually no local control over what they do even though it is a federal government creation, operating with tax dollars. Their land acquisition planning is done behind closed doors. It follows a Congressional Management Plan established and approved by the US Department of Interior National Park Service and the preservationist elite. The SVBF and their “non-profit partners” claim they are “private” organizations, but the details of their land acquisition and financial operations are kept hidden. They offer large sums of money to tempt people to sell land—and then claim they only work with “willing sellers.” They claim they are not driving up property assessments and local taxes. They can be friendly and sweet and persuasive when it suits them, but they will use people to their advantage if they can, especially respected people with recognized names in the community. The ‘preservationists’ make promises about ‘historic tourism’ helping the local economy. But where are the jobs? If a job does come along, who gets it? Almost always, the family members and friends of the preservationists get the jobs. There are always some good-hearted people who are fooled into working for them, who may get a few of the dollars taxed out of their neighbor’s pockets. Is that really helping the community? I can’t tell you what to do. I can only warn you, as I have been trying to do for the past eight years, about NPS involvement and what is being planned for McDowell. Don’t believe anything I have written here. Check the facts for yourself. Study the documents. Go to Richmond, or Manassas, or Canaan Valley, or Louisa County, or the New River Gorge, or along the Blue Ridge, or Antietam, or Waterford—or a hundred other places where the National Park Service and their “partners” have been at work. Travel around Virginia or West Virginia as I have done. Talk to the land owners, the home owners, the pastors, farmers and small business owners who have been victims of the same type of “Management Plan” now being implemented in McDowell. Convince your family, friends and neighbors to tell your elected officials, your supervisors, Jerry Rexrode, Lee Blagg and Robin Sullenberger, members of the Planning Commission, the Board of Zoning Appeals and others, to get Highland County completely out of the Shenandoah Valley National Historic District and out of the National Park Service’s National Heritage Area. Let Bob Goodlatte, Emmett Hanger and Chris Saxman know how you feel. If you need addresses or phone numbers, or need help contacting them, or writing them a letter, let me know. The old Hull house (c.1851) in McDowell, most recently the home of a local farmer, was “purchased” almost entirely with federal tax funds. It is destined to be the The Highland Historical Society’s “museum” and a SVNHD “visitor center.” One local resident bitterly remarked, “Southerners should be real proud of their federal museum. My ancestors would have run this bunch out of the county. They buy land; buy county officials with ‘grants;’ soon they’ll buy it all.” Congressman Bob Goodlatte helped secure $200,000 in federal funds for ‘building restoration’ through the National Park Service “Save America’s Treasures” program. “As partners in this undertaking, we intend to donate to the National Park Service all our holdings at these nationally significant sites or enter into cooperative management agreements at the Service’s discretion…The National Park Service, moreover, has demonstrated its unparalleled competence as an historic site manager at hundreds of sites across the country…”— Congressional Testimony, A. Wilson Greene, President, Association for the Preservation of Civil War Sites, July 25, 1994. The APCWS is now merged with the Civil War Preservation Trust. The CWPT owns 126.5 acres of the McDowell battlefield. HISTORIC PROPERTY AT MALVERN HILL TRANSFERRED TO NATIONAL PARK SERVICE.� The Civil War Preservation Trust (CWPT) and the Richmond National Battlefield Park are pleased to announce the preservation of 253 acres of battlefield ground at Malvern Hill in lower Henrico County… The National Park Service (NPS) recently closed on the property, making the transfer from CWPT official �Civil War Preservation Trust, Press Release, April 26, 2005. Mr. Lighthizer’s group [CWPT] was there because they had helped preserve a 280-acre parcel of land former National Park Service chief historian Edwin Bearss described as the “center of the donut.” For a variety of reasons, the parcel had remained in private hands for decades, even as surrounding farms and woodlands were made part of a national park. To buy the land when it came on the market, the federal government ponied up about $1.95 million. But the appropriation fell $36,000 short and there wasn’t time for the federal bureaucracy to crank out more money. “The Park Service called, and I said ‘Hell, yes!’” Mr. Lighthizer said. —The Annapolis Capital, Annapolis, Md., April 26, 2005. Lighthizer has served as president of the Civil War Preservation Trust since it was formed in 1999. “An objective review of the Hudson River Valley National Heritage Area Management Plan logically would lead to the conclusion that it is loaded with anti-heritage elements…In 1996 the National Park Service declared that the Hudson River Valley was the landscape that defined America. The Service has been shown to have an insatiable appetite… it is not just the historic sites that are targets of control, but the entire ten counties…The Heritage Area will create Heritage Area Trails. Up goes the red flag, for the encroachment that is sure to follow. Again, beware of those trails, trailways, corridors, and other gimmicks that suggest absolute control. Heritage tourism will subsequently be promoted… It is obvious that the time is long overdue for every citizen who might be impacted by the Heritage Area program, or other such monstrosities, to give serious thought to the implications…There is far too much control by special interests with the public-be-damned attitude.”—Nathaniel R. Dickinson, March 2, 2004, a biologist retired from a 35-year career in wildlife management, 21 years with the New York State Conservation Department. “During the battle of Piedmont the federal government took our belongings and our ancestors’ lives; now they want to do it again, only this time they want to worry the people to death instead of shooting them…The site doesn’t look like a battlefield now so what is there for people to see…The majority of the people who live on the site are in the agricultural business and don’t want to be in the tourist business…The National Parks already own too much land that is not properly cared for now. 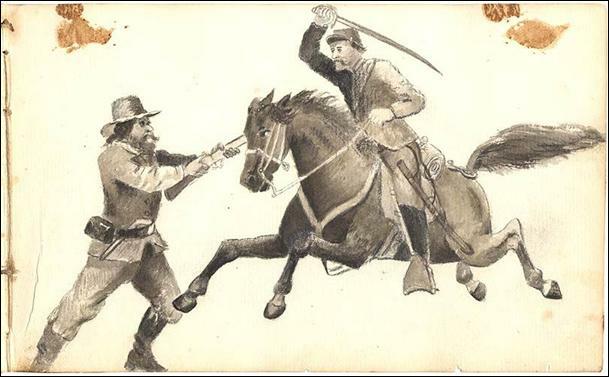 The federal government doesn’t need to go further in debt to deprive landowners of their property rights.”—Virginia Senator Frank W. Nolen, January 3, 1992, in a letter telling the National Park Service not to include the site of battle of Piedmont (near New Hope, Virginia) in Shenandoah Valley National Battlefields Historic District “preservation” plans. “I think the government should decide how landowners can use their land.”—Don Hower, February, 2005, Highland County Comprehensive Plan Review Committee meeting.